Weather: Partly cloudy, mid 60s, mild breeze. Near perfect! The Skinny: Frankly, we could spend a few pages listing all the notable teams and individuals at the St. Olaf Showcase, Minnesota's first major competition on the grass. Top ranked Wayzata, a likely NXN caliber team, will not be running their varsity squad. This opens the door for a handful of other top Class AA teams to fight for the win. Other ranked teams include 4th ranked Mounds View, 5th ranked Red Wing, 6th ranked Buffalo, and 10th ranked Winona, meaning there will surely be major shakeups in the rankings after this meet. Red Wing impressively swept the Wabasha-Kellogg Gallop in a two-mile race, but this meet may be a somewhat quick turnaround for them. On paper, the Wingers win by a small margin, but they will have multiple teams capable of hunting them down right behind them. Mounds View probably has the best 1-2 punch in Austin Streit and Lukas Hessini, which may make them the favorites for 2nd. 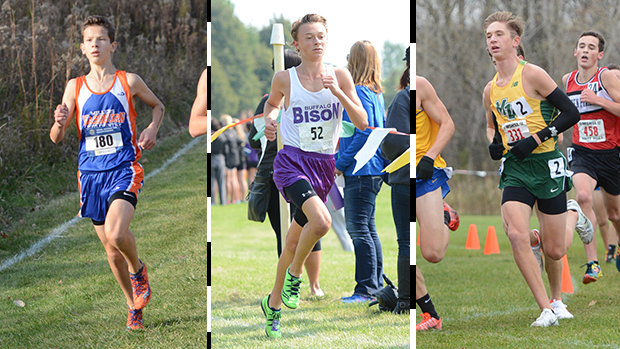 Buffalo has extremely strong depth, with the fastest 5th runner in the field by PR. However, they'll need their 2-5 pack to finish higher up to dethrone Red Wing's strong core. And don't sleep on unranked White Bear Lake, who won this meet a year ago and seem to be severely underrated entering this season. Individually, 5th ranked Isaac Basten will attempt to defend his title, but will experience much more competition than he did last year. Hessini and 7th ranked Streit should also be in the mix, as should Charlie Babcock, who dropped a 9:25 3200m at State this spring. A sleeper pick is Weston Wyatt of Red Wing, who beat his teammate Nemanich over two miles to lead the Wingers on Monday. And Caleb Haugland, currently ranked 8th in Class AA, owns the fastest PR in the field at 15:30. But with 9 athletes under 16:00 and a whopping 62 boys under 17:00, one thing's for certain: it will be INCREDIBLY tight. The Skinny: The main attraction to this meet will be the enormous preseason matchup between three national caliber runners. 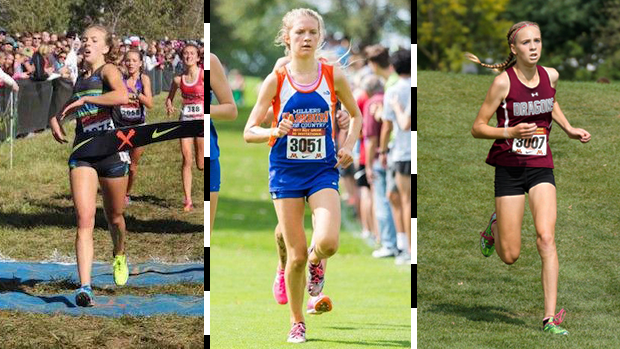 Foot Locker All-Americans Tierney Wolfgram (US#12) and Emily Covert (US#5) will attempt to defend their home turf against US#13 Lexy Halladay, who will be making the trip from Idaho to Minnesota for this race (her second such trip after winning the Roy Griak Invitational in 2016). After a historic track season, Covert (10:05.19 full 2-mile) should probably be favored in this matchup, though with such talent from her competition, anything can happen. Regardless, some combination of Covert, Halladay, and Wolfgram should make up the top three. As each of these runners could conceivably end up on the podium at either national meet, the outcome of this meet will shed major light on the national rankings. Behind them, expect Wayzata's duo of Emma Atkinson (ranked 3rd in Class AA) and Caroline Sassan (ranked 6th) to lead the chase pack. At times during track, 5th ranked Grace Dickel looked like the second-fastest girl in Minnesota, and should be in the mix as well. Other ranked runners include 7th ranked Brianne Brewster and 8th ranked Ali Weimer, while Rachel Ball was 7th at the 2017 edition of this meet in a strong time of 18:40. The US#2 Wayzata girls return their entire top five from their 7th place team at NXN last season, and should win fairly easily. Led by Halladay, the US#23 Mountain View girls are projected to take second, just in front of 3rd ranked St. Michael-Albertville. If Ali Weimer and Annalise Davis can keep Mountain View's top three close, they will be favored for second because that's where Mountain View creates most of their separation. That won't be an easy task though, as Kortlyn Lowry and Morgan French are a very formidable 2-3 in support of Halladay. 4th ranked Forest Lake and Hudson were second and third in 2017, and should also be near the top. The Lakeville South girls are currently ranked 11th in Class AA, while the Perham girls didn't lose anyone from their Class A championship and could also be a factor.